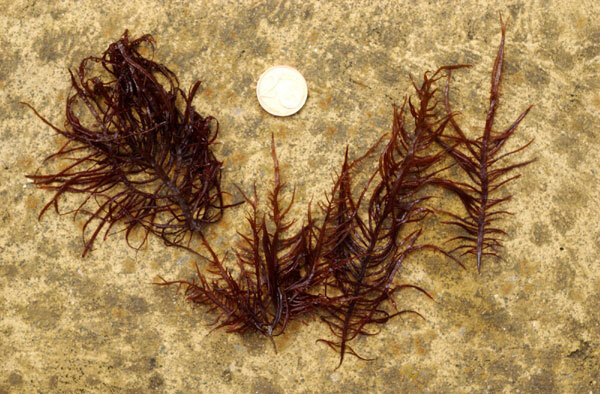 Description: Compressed, tufted, dark purplish brown fronds, to 120 mm high, main axis 1-4 mm broad. Once or twice pinnate, axes and branchlets tapered at base and apex. Habitat: On rock in pools. mid-intertidal to shallow subtidal, sporadic, often locally common; SW England and Wales, S and W Ireland north to Donegal. Similar species: Plants known as Grateloupia filicina var. luxurians A. & E. S. Gepp, found on pebbles and shells in open muddy and sandy estuarine habitats in Hampshire and Dorset, are now referred to as Grateloupia subpectinata Holmes. This entity, which is very much larger than Grateloupia filicina var. filicina at up to 500 mm in length represents an immigrant, perhaps of Australian origin, the first European record of which was from the Isle of Wight, in 1949. It is likely to have been introduced into harbour areas in Australia, Brittany, Spain, and Mediterranean France, probably from Japan. Site © M.D. Guiry 2000 - 2019. Important copyright notice: all text, design and photographs on this site are copyrighted by M.D. Guiry unless otherwise stated and all rights are strictly reserved. Click here for copyright information and contact. Website design: 249 Design Studio. Site maintained by M.D. Guiry (michael.guiry@nuigalway.ie). There have been 8736874 page loads since 1 January 2014 on 25 April 2019.